The ace series of cameras offer fantastic value. This model is built on the Sony Pregius IMX183 20 MP back-illuminated sensor. 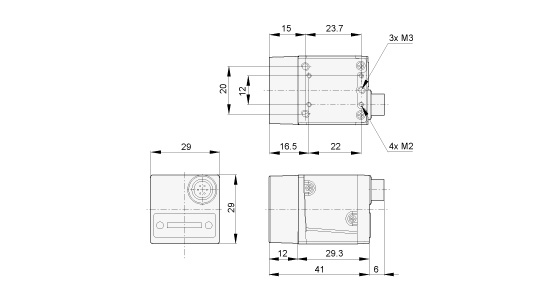 It offers excellent sensitivity with low noise despite the small 2.4 µm pixels. Those small pixels keep the image format within the 1" standard for a greater selection of compatible lenses. This camera features Basler PGI for reduced noise and improved sharpness. This is especially useful when imaging small features. 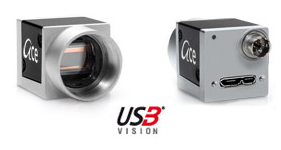 With USB3 Vision, a single cable supplies camera power and transfers data between the camera and PC. An auxiliary connector provides termination for the input and output signals. This camera has a rolling shutter for improved sensitivity. Because this camera is USB3 Vision and GenICam complaint, there are many third party software applications and API’s that are compatible. Basler offers their royalty-free Pylon SDK for 32 and 64 bit Windows and Linux platforms.